Could flooding move the Mississippi? Since its formation ages ago, the Mississippi River has shifted course many times. At one point it emptied into the Gulf of Mexico from Texas; at another, from the Florida panhandle. Both natural and man-made events have altered the face of the river basin considerably in the last few hundred years. And, in its current configuration, the so-called "Great River" (from the Ojibwe word, "misi-ziibi") is the beating heart and lifeblood of Louisiana. But that might not always be the case. The river basin is currently grappling with historic levels of flooding, from Missouri down through the Gulf. The Mississippi crested at a near-historic height of 48 feet in Tennessee on Tuesday. Yesterday morning it rose to 58 feet in Natchez, Miss. -- a record -- and appears likely to swell to 64-feet before topping out. By the time the crest reaches Red River Landing in northern Louisiana, probably on May 22, it could eclipse previous records there by more than 3 feet, according to Jeff Masters at Weather Underground. Red River is significant, because it's the site of a major floodgate system called the Old River Control Structure that helps keep the Mississippi on its current course. If the ORCS fails in the face of this month's floods, some worry it could cause epochal shift in the path of the river -- one that would irrevocably alter the face of Louisiana. Here's the background: Once the Mississippi River enters the Bayou State, it turns sharply east before emptying into the Gulf of Mexico, 95 miles downriver of New Orleans. But a shorter and steeper path to the ocean lies to the west along the Atchafalaya River, a distributary of the Mississippi and Red rivers that cuts through the heart of Cajun Country. In the 1950s, scientists concluded that the Mississippi was on the brink of shifting course, and its main flow would divert to the Atchafalaya by 1990. If that were to happen, New Orleans and Baton Rouge would be choked off from water and areas such as Morgan City (which sits at the mouth of the Atchafalaya) would be inundated. With its fresh water gone, its harbor a silt bar, its economy disconnected from inland commerce, New Orleans would turn into New Gomorrah. This nation has a large and powerful adversary. Our opponent could cause the United States to lose nearly all her seaborne commerce, to lose her standing as first among trading nations. . . We are fighting Mother Nature. . . .It’s a battle we have to fight day by day, year by year; the health of our economy depends on victory. That in mind, Congress instructed the Army Corps of Engineers to design a mechanism for trapping the Mississippi River along its current path, without cutting off the Atchafalaya River by damming it up. (Doing so would dry up Louisiana's signature Cajun swamp lands and deprive a fair portion of the state of a major water source.) In 1963, the Corps completed the Old River Control Structure. The system shunts a strict 30 percent of the river flow down the Atchafalaya, coursing the remaining 70 percent through the Lower Mississippi. Current flooding tests the limits of the government's flood management system, which includes a whole slew of levees and spillways in addition to the ORCS. The Bonnet Carré Spillway, just a dozen or so miles west of New Orleans, was opened on Wednesday "to divert 250,000 cubic feet per second of water from the Mississippi River into Lake Pontchartrain, some 28 miles upstream from New Orleans." Also Wednesday, Louisiana Gov. Bobby Jindal indicated that the Morganza Spillway -- about 280 miles upriver, and just south of the ORCS -- could be opened up early next week, directing 300,000 cubic feet per second of the Mississippi's flow into the Atchafalaya basin. If the Spillway remained closed, "the additional water could cause levees to fail along the river from Morganza to Plaquemines Parish, including all of the New Orleans area, resulting in as much as 25 feet of floodwater," according to the New Orleans Times-Picayune. This would mark only the second time the spillway was opened, after a series of 1973 floods that brought Louisiana's entire flood management system to the brink -- and nearly precipitated the shift of the Mississippi, according to America's Wetland Resource Center. The flood "partially undermined the Low Sill Structure [of the ORCS]. If it had failed, the [Mississippi River] probably would have shifted to the [Atchafalaya River] and possibly not been able to be shifted back." The Corps has since installed new structures to help prevent against "the near-catastrophe of 1973" in the future. 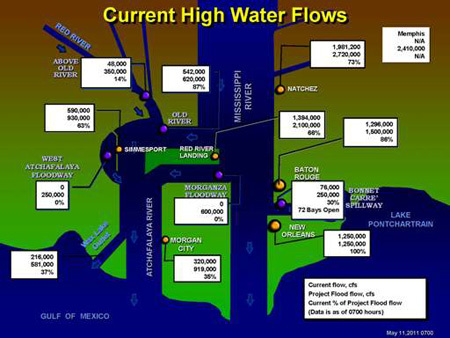 Still projections for current flooding suggest it's more severe than that of 1973. And the ORCS is already pumping twice as much water as usual into the Atchafalaya. There's been little discussion in the media thus far about the possibility of a course change as a result of the current flooding. And, perhaps, the current systems can successfully contain the Mississippi and prevent its capture by the Atchafalaya. In the long run, however, some see the outlook as bleak. The instability of the present course of the Mississippi increase each year. The ORCS was acutely threatened in the floods of 1973 and 1993; at present only die-hard USACE [Army Corps] regulars would still insist that the ORCS can prevent the escape of the entire Mississippi to the Atchafalaya.